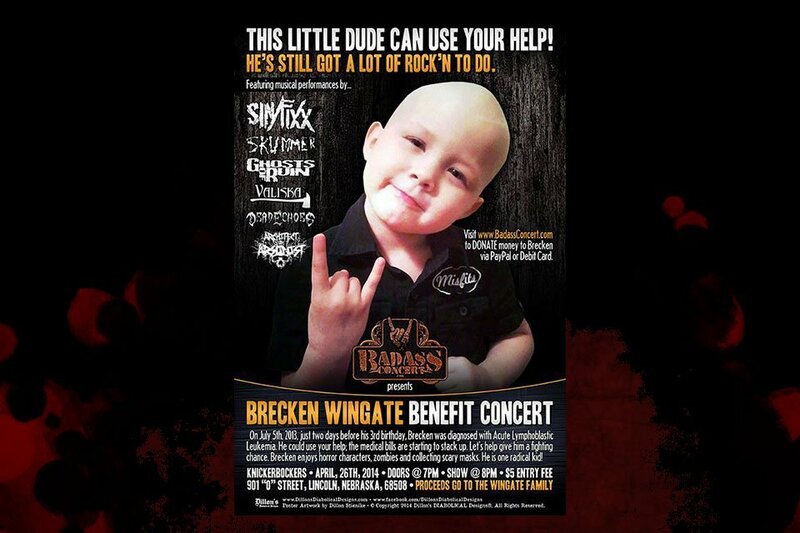 Brecken Wingate benefit concert details. | Badass Concert | Heavy Metal Music News | So METAL, we piss RUST! Home News Brecken Wingate benefit concert details. Brecken Wingate benefit concert details. His name is Brecken Wingate. On July 5th, 2013, just two days before his 3rd birthday, Brecken was diagnosed with Acute Lymphoblastic Leukemia. He could use your help; the medical bills are starting to stack up. Let’s help give him a fighting chance. Brecken enjoys horror characters, zombies and collecting scary masks. He is one radical kid! To help Brecken’s family with the burden of medical expenses, BadassConcert.com would like to present the “Brecken Wingate Benefit Concert”. The concert event will be held on April 26th, 2014, at Knickerbockers. The venue address is 901 “O” Street, Lincoln, Nebraska, 68508. The doors open at 7pm, the music starts at 8pm. The following bands have opted to donate their time to rock this concert. Featuring musical performances by Sin/Fixx, Skummer, Ghosts Of Ruin, Architect Or Arsonist, Valiska and DeadEchoes. There will be a $5 entry fee at the show. All proceeds will be going to the Wingate family. If you have a scheduling conflict and cannot make it to the show, you can help out by donating via PayPal button below. PayPal is the safest way to transfer funds on the internet. The page uses SSL certification with encryption for security. You don’t even need a PayPal account. PayPal accepts debit and credit cards as well. Online paypal donations finished. Contact us if you wish to donate. Big thanks to Knickerbockers and all the bands involved. The staff at BadassConcert.com wish Brecken a speedy recovery. Thanks for reading and keep it METAL! RSVP on facebook click here. Previous articleBy The Thousands release new single EARLY! Next articleA Different Breed give us a different interview!